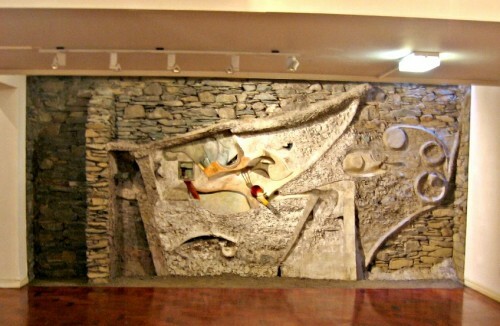 Schwitters created his large sculpture on the interior wall of a small dry-stone barn. A dry-stone building is made from just loose stones, a problem when it came to removing both sculpture and wall in one piece. 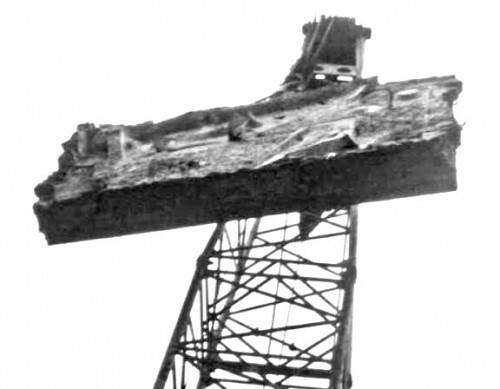 To consolidate everything into one mass, the Hatton’s removal team built a steel frame behind the wall then filled it with concrete to embed all the stones. 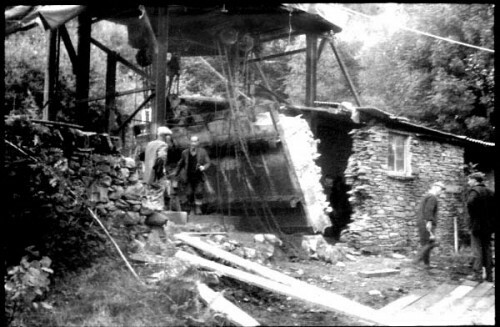 While successful, it did leave them on a hillside, in the Lake District, 150 yards from the road, with a lump of slate, steel and concrete weighing twenty-five tons – ‘Hang on a minute, lads, I’ve got a great idea..’. Schwitters had moved to Norway in 1937 to escape increasing Nazi harassment but when Germany invaded in 1940, he fled to Scotland, where he was immediately arrested as an enemy alien. While in internment camp he continued to make new works, and his practice of creating art with whatever materials were to hand – his philosophy of ‘Merz’ – proved invaluable. Paints were improvised using oil from sardine tins, sculptures formed from leftover porridge and for a paintbrush Schwitters persuaded a fellow internee to donate some (perhaps all) of his presumably very bushy eyebrows. After the War, Schwitters and his partner, Edith Thomas, moved to Ambleside in the Lake District. He sold the occasional landscape, still-life or portrait, but there was little interest among the locals for the many collages he produced and he struggled financially. On occasion he resorted to asking for bread from the rear of the local bakery and a friend recalled Schwitters and Edith debating whether they could afford to buy an apple. 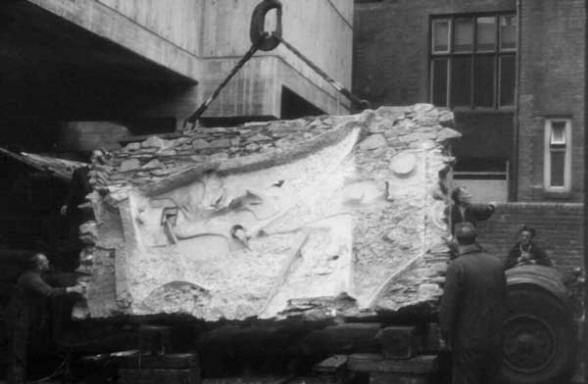 In 2014 a Schwitters collage, Ja – Was? – Bild, sold at Christie’s for £12,400,000. 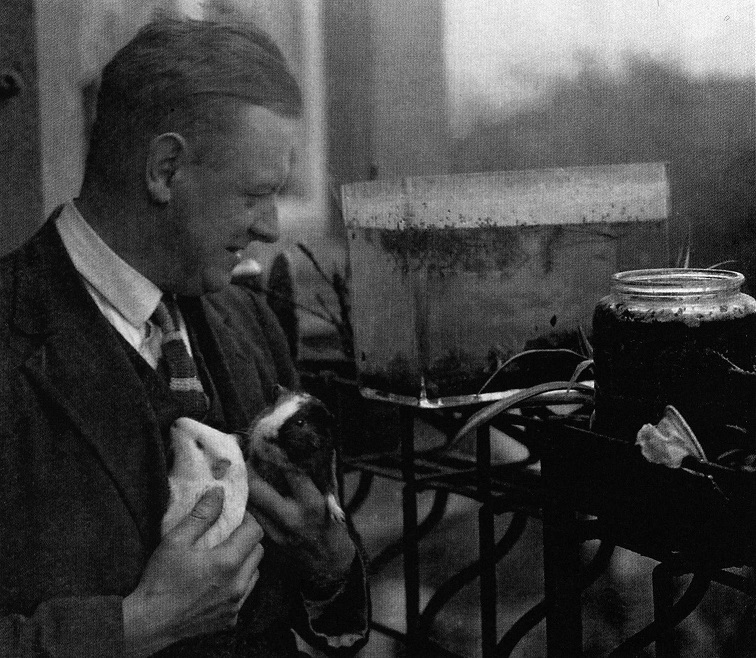 To boost his meagre earnings while living in the Lake District, Schwitters entered the Ambleside Flower Painting Competition, but a professional artist entering a competition essentially for amateurs was, well, not really cricket. So First Prize was won by ‘Mrs Vartis’ for her roses and Second Prize by ‘Mr Bickerstaff’ for his chrysanthemums. 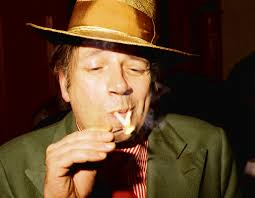 George Melly, jazz singer, writer and critic, died in 2007 after a life that embraced every tenet of the term ‘Bohemian’. The only predictable aspect of George was his unpredictability, but on one occasion it proved his salvation. Emerging from a Manchester jazz club, Melly was confronted by two muggers who threatened him with a knife. Unwilling to give up his wallet and watch, George suddenly launched into a recital of Schwitters’ abstract sound poem Ursonate. So intimidated were the thieves that they ran off. The wonderful Chuwumbawumba featured the story in their song Ratatatay and you can listen to Schwitters himself reciting the poem here. Following his arrival in Britain, Schwitters heard about the concentration camps. He renounced his status as a German national and never spoke the language again. He also applied for British citizenship. It arrived in the post the day after he died. By sheer coincidence, the Merz Barn Wall was installed into the Hatton Gallery on 20 June 1966, what would have been Schwitters’ 79th birthday. Just before his death in 1948, Schwitters declared ‘No-one knows who I am but in sixty years they will’ – but he hadn’t reckoned on Monty Python. In the very first episode of Flying Circus in October 1969, they mentioned Schwitters in a sketch about famous artists competing in a cycle road race: ‘And right at the back of this group, our very own Kurt Schwitters!’ You can see the clip here. ‘Revitalising The Hatton Gallery’ is funded by Heritage Lottery Fund.